Several accessories for exploring rotational inertia. Demonstrate Conservation of Angular Momentum, investigate point masses, or use the pulley to create constant angular acceleration. Add the Rotational Inertia Accessory to the Wireless Rotary Motion Sensor (PS-3220) or the PASPORT Rotary Motion Sensor (PS-2120) to study the oscillations of a pendulum, the rotational inertia of an aluminum disk, a steel ring, and a metal rod with adjustable masses, as well as the conservation of momentum durin a rotational collision. The clamp-on Super Pulley allows students to aply a torque by hanging a mass over the pulley. 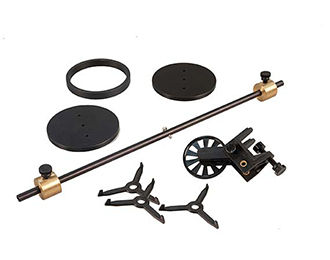 Note: If you only want to study the conservation of angular momentum, the Ring and Disk Set (ME-3419) includes the disks, ring, and alignment guides from this set while omitting the pendulum rod, adjustable masses and Super Pulley. To demonstrate conservation of angular momentum, a non-rotating ring is dropped onto a disk that is rotating on a Rotary Motion Sensor. The angular velocity of hte disk is recorded in real time and students can easily determine the angular velocities of the disk just before and after the ring is dropped. Combining these velocities with the rotational inertia of the disk and ring, students can confirm that angular momentum is conserved. An alignment guide is placed on top of the rotating disk and is threaded onto the shaft of the Rotary Motion Sensor. This guide helps to align the ring precisely when it is dropped onto the spinning disk.